It has been amazing how quickly the messy clearing with its lumpy dirt and rocks has renewed itself with new life. Grass has been popping up almost everywhere, and baby acacia trees too. There would be a massive seed bank of lomandra, casuarina, and tea tree - along with the various varieties of eucalypt - just sitting in the soil waiting for an opportunity. In fact I was thinking that I should dig some lines with the pointy side of our mattock out at the front of our land - the part where the trees haven't been cleared - and get some acacias growing out there for extra privacy. They love growing in open disturbed places and it seems like the perfect opportunity. 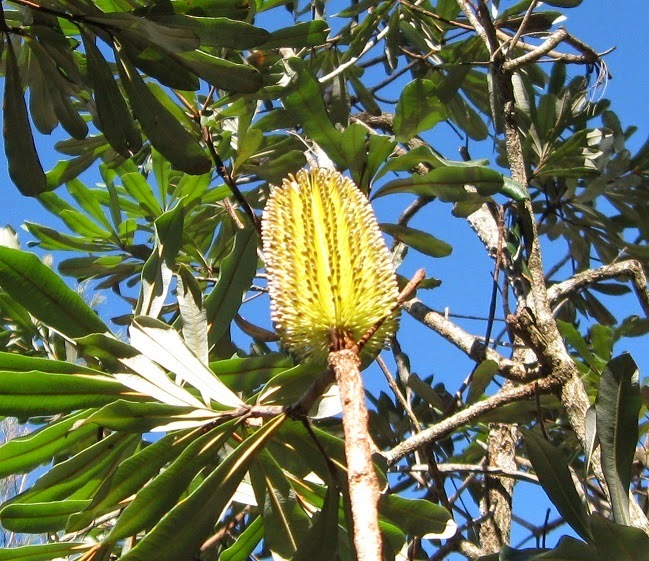 The lone banksia tree on our place which we specifically saved from the clearing has rewarded our thoughtfulness with a burst of flowers. Suddenly the tree is getting light that it never had before, and I hope this is a sign that the tree is much happier now. Otherwise it could mean that the tree is about to die and wants to flower one more time before then! The birds, insects and glider possums will be very happy to have a feed of delicious nectar. Some of the animals seem to like the new habitat too - there are a couple of Willy Wagtails who have claimed it as their territory. They spend all day flying across the dirt and perching on sticks, waggling their tails and chasing insects. When the Yellow-tufted Honey-eaters come too close the Wagtails chide them, letting them know that the area has already been claimed. The microbat also seems to enjoy flying along the open edges of the clearing at dusk, having a clear path to chase insects instead of having to avoid trees while flying! I like to imagine the bandicoot has had a bit of a wander down there too, checking out all the disturbed grubs making for an easy dinner. The bull-ants also seem to be having a lovely time, biting us when we stand too close to their nests. I am trying the method of pouring boiling water down the nest right next to the house site, but it is not completely successful yet. Any suggestions about how to safely remove such aggressive monsters?